The utility has an option to purchase an additional 101 of the 2.3 megawatt turbines in 2012 for later phases in its Lower Snake River wind project. No financial details were released. The deal includes a five-year service agreement. Shipments are expected to begin in March 2011. "This order is an important stepping stone towards becoming one of the top two wind turbine supplier in the U.S.," says Rene Umlauft, chief executive of Siemens Renewable Energy Division. "We look forward to working with PSE to further advance its renewable energy initiative in the United States." PSE , the state’s oldest, local energy utility, says the initial 149 units will generate power for more than 100,000 homes. "The Siemens wind turbines for Phase I of Lower Snake River will significantly increase PSE's capacity for generating clean, renewable wind power," says Kimberly Harris, executive vice president and chief resource officer for PSE. PSE is the second-largest US utility owner and operator of wind power with its existing Hopkins Ridge and Wild Horse wind facilities in Washington State. Lower Snake River Phase I will be its largest wind power project to date. 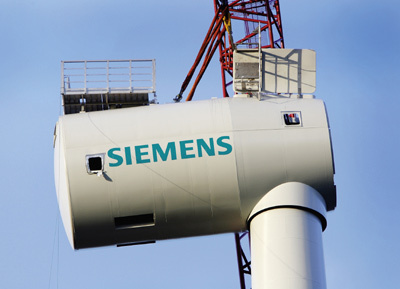 To better meet the increasing demand for clean energy in the Americas, Siemens is building a nacelle assembly facility in Hutchinson, Kansas, that is due on line in December. The 300,000-square-foot facility is expected to employ 400 workers. Siemens also recently expanded its 600,000-square-foot blade manufacturing facilities in Fort Madison, Iowa, which currently employs more than 600 people. The Siemens Wind Power business is well on its way to exceed 1,500 employees in the US by yearend, the company says. PSE serves more than 1 million electric customers.